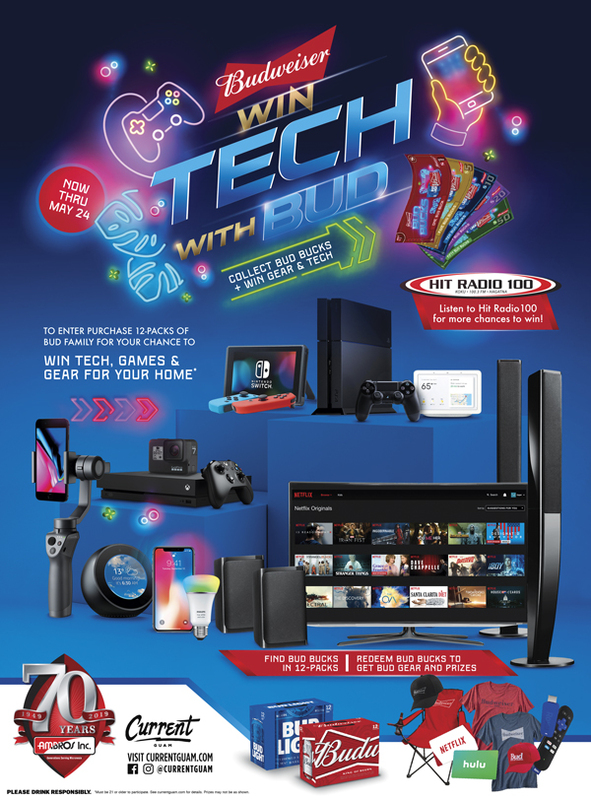 Purchase 12-packs of Bud Family from now until May 24th to find Bud Bucks for your chance to win great tech like Go Pros, Google Home Hubs, Amazon Echo Spots, Phillips Hue Bulbs, DJI Osmo Gimbals, Apple Air Pods, PS4s, XBOX Ones, Nintendo Switches, TVs and more. Tune in to Hit Radio 100 for weekly giveaways and more chances to win! Plus, redeem your Bud Bucks for awesome Budweiser gear! Find the Current Guam Promo Team this week at these locations to redeem your Bud Bucks for awesome Budweiser gear! The Promotion is open to all legal Guam residents, aged 21 years or older, except employees and agents of Ambros Inc., their suppliers, affiliates, subsidiaries, wholesalers, promotion and advertising agencies, and all retail licensees, nor are their relatives or members of their families or households. Winners will be required to provide proof of eligibility on request and as a condition to the delivery of the applicable prize. Submitted email addresses may be used for future promotions. The Promotion is subject to these Rules, as well as specific directions, if applicable, are available for review at Ambros Inc. In the case of conflict between these Rules and such specific directions/terms and conditions, these Rules shall prevail. By participation in the promotion, you are deemed to accept these Rules and the specific directions/terms and conditions as well as any terms and conditions of any relevant third party. To receive an entry form, no purchase necessary, send a self-addressed stamped envelope to Marketing Department, P.O. Box A, Hagatna GU 96932. Limit one entry per request; one request per outer mailing envelope. Prizes Include: Flatscreen HDTVs, Home Theater Systems, Nintendo Switches, Xbox Ones, PlayStation 4s, Amazon Echo Spots, Google Home Minis, Google Home Hubs, DJI Osmo Mobile 2s, DJI Osmo Pockets, GoPro Hero 7s, Bose SoundLink Micros, Phillips Hue Starter Kits, Roku Streaming Sticks. A 1099 will be issued for all prizes valued above $600. Winner is responsible for all taxes on said prizes. Game materials are void if reproduced, mutilated, forged, altered or tampered with in any way, if obtained from outside authorized, legitimate channels, or if they contain printing, production, typographical, seeding, mechanical or other errors. Liability for any game materials containing printing, seeding or other errors is limited to replacement with another entry form, while supplies last. Only the number of prizes stated in the Official Rules will be awarded. If, for any reason, the number of prize claims received exceeds the stated number of prizes at any prize level, such prizes will be awarded through a random drawing from among all prize claims received for that prize level. Sponsor assumes no responsibility for lost, late, illegible, postage-due entry form requests. All game materials submitted will be the property of the sponsor and will not be returned. Sponsor reserves the right to substitute prizes with prizes of equal or greater value. All taxes on prizes are solely the winner’s responsibility. Failure to claim a prize by the time or in the manner specified for the promotion will make any claim invalid. The sponsor reserves the right, in its sole discretion, to cancel, modify or suspend the promotion should unauthorized human intervention, technical failures or any other factor beyond the sponsor’s reasonable control corrupt the administration, security, fairness, integrity or proper operation of the promotion. In such event, the sponsor reserves the right to award the prize at random from among the eligible entries received up to the time of impairment. The sponsor also reserves the right in its sole discretion to disqualify any individual it finds to be tampering with the entry process or the operation of the promotion or to be acting in violation of these Rules or in an unsportsmanlike or disruptive manner. The sponsor’s failure to enforce any term of these Rules shall not constitute a waiver of that provision.